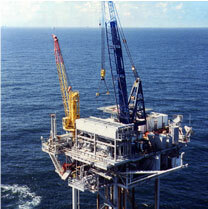 For two decades Fluid Crane & Construction has provided the Domestic and International Offshore oil & gas industry with modular rental cranes. Trailblazing the path in this corner of the industry, Fluid Crane has created the worlds largest offshore skid mounted modular crane. The 150 ton is available with boom lengths of 70, 90, 100, & 120 feet. This crane has performed lifts from boat to platform in excess of 200,000 lbs. Also available are a variety of modular rental cranes ranging in size from 5 ton to 150 ton. An expert staff at Fluid Crane will assist clients with project planning to job completion.